An Emmanuel Adebayor hat-trick helped destroy Derby and keep Arsenal at the top of the Premier League table. Abou Diaby put the Gunners ahead with a vicious drive into the top corner. Then Adebayor showed exquisite control to take down a Cesc Fabregas pass on his chest before rounding Stephen Bywater and slotting a second. Adebayor struck a second-half penalty and Fabregas rifled in a shot before Adebayor again chested the ball down and placed it low beyond Bywater. It was more evidence of an Arsenal side playing with flair, vision and without fear. But if given time to pick their options and spray their passes unpressured and unhurried, teams of lesser quality than Arsenal will find it easy to punish Derby. And at times the visitors' organisation, discipline and motivation was woeful - allowing a fluid Arsenal team to cut through at will. After only four minutes Tyrone Mears was shockingly sloppy when he gifted the ball to Gael Clichy and when the Frenchman sent in a teasing cross Adebayor was inches away from converting. It was a warning Derby did not heed and they backed off Diaby six minutes later, allowing him to cut in from the right, skip a couple of challenges and smash a vicious shot into the top corner. Diaby then almost repeated the trick but this time Bywater did well to push away a low shot. Inevitably, the second goal was not long coming. And when Fabregas picked out Adebayor, the tall striker made the rest look easy to effectively end the game as a contest. That is if it was ever a contest, with Derby's body language indicative of a team that appeared to be beaten even before kick-off. It provided a perfect environment for Eduardo da Silva to gain confidence in his first Premier League start. He almost added his name to the score sheet, when he headed a powerful effort but Bywater denied him with a save reminiscent of Gordon Banks' famous stop from Pele. There was no respite for Derby after the interval - and five minutes after the restart Arsenal went further ahead. Bamboozled in his own area, Matt Oakley tugged back Eduardo and Adebyaor confidently stroked home the resultant spot-kick. Thoughts turned to how many Arsenal might score - could they match or even better Liverpool's six against Derby a few weeks ago? Kolo Toure could have done better with a flying header, Theo Walcott went on a fabulous, mazy run that did not end with the finish it deserved and Adebayor headed over the bar. But when the inspirational Fabregas picked up the ball on the edge of the box, there was only really going to be one outcome. Bywater picked the ball out of the back of the net after being beaten by a rasping effort. The final word went to the outstanding Adebayor, who once more demonstrated superb chest control before slipping the ball into the bottom corner. "This team means business. We are not there to show off. We want to achieve something together. "We try to play football we love here, it is linked to what we aspire to do. When we don't win we are criticised, when we win people love us. "There is still room for improvement and the target is to get better and hopefully peak in April and May." "The early goal cost us dearly, it was poor defending even if it was a top-class finish. "We were playing against Adebayor, without doubt one of the top strikers in the world, and Fabregas - one of the best midfield players. "There is no embarrassment to come here and get a lesson off them. We are not despondent, we are getting better." 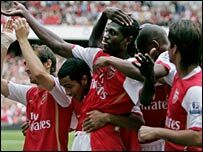 Arsenal: Almunia, Sagna, Toure, Senderos, Clichy, Walcott (Diarra 72), Fabregas (Denilson 71), Flamini (Song Billong 77), Diaby, Eduardo, Adebayor. Subs Not Used: Fabianski, Van Persie. Goals: Diaby 10, Adebayor 25, 50 pen, Fabregas 70, Adebayor 79. Derby: Bywater, Mears, Leacock, Davis, Griffin, Teale, Oakley (Feilhaber 56), Pearson, Lewis, Howard (Barnes 75), Miller (McEveley 84).